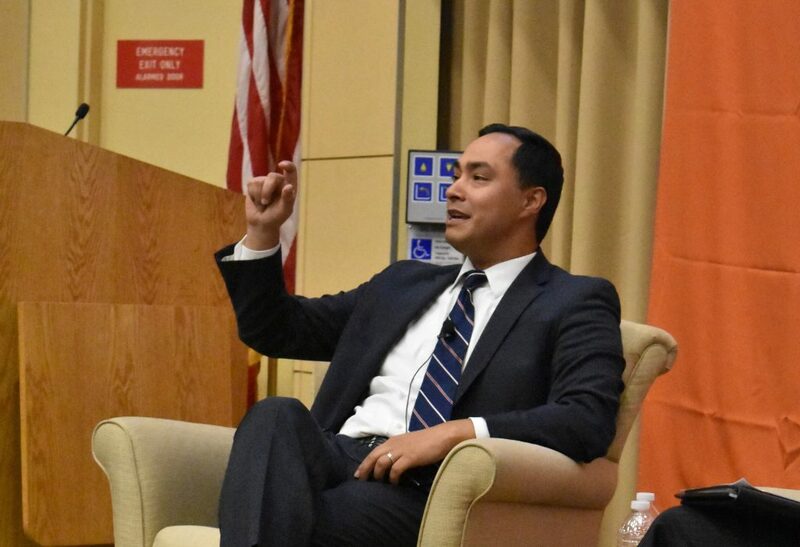 Rep. Joaquín Castro, a leading Democrat in the House of Representatives, discussed foreign policy and domestic issues at the Cabot Intercultural Center’s ASEAN Auditorium Wednesday night. The event was co-sponsored by The Fletcher School of Law and Diplomacy and the Jonathan M. Tisch College of Civic Life. Castro, who has represented Texas’ 20th Congressional District since 2013, was introduced by Ian Johnstone, interim dean of The Fletcher School. Johnstone listed Castro’s committee assignments, which include seats on the Foreign Affairs and Intelligence Committees, and highlighted his roles as vice chair of the Congressional Hispanic Caucus and as chief deputy whip in the House Democratic Leadership. Castro then delivered some introductory remarks. He highlighted the fact that 70 million people are currently displaced from their homes around the world, whether fleeing ethnic conflict, like the Rohingya in Myanmar, escaping war in Syria or avoiding famine in Africa. Castro used the cases of Central and South American immigrants, who arrive at America’s borders fleeing persecution, to demonstrate the convergence of foreign and domestic policy. Castro explained that in all of these crises, the United States is seen as a leader, the protector of world order. He expressed concern that the Trump administration is leading America away from that role. “If the U.S. isn’t seen as the leader of nations and the leader of NATO, what does it mean for us?” Castro asked. After Castro’s remarks, Johnstone asked him two questions about this criticism of President Trump’s foreign policy — one about the administration’s expression of policy, and another about its content and results. Using an anecdote about conflicting statements on Israel that Trump and former Secretary of State Rex Tillerson gave within hours of each other, Castro explained that one of the biggest problems with the White House’s foreign policy is its lack of clarity. “Sometimes you’ll get two answers [on a policy question] from the president himself,” he said. Castro explained that this confuses both American and foreign lawmakers. He described a diplomatic trip to Japan and South Korea during which he was repeatedly asked to indicate which White House official reliably speaks for the president. Castro expressed concern that, as a result of this muddled foreign policy, countries would simply avoid dealing with the United States. “When I hear the president start to back away from [America’s commitments abroad], that makes me wonder how long it will take for some of these countries to start moving around the United States,” he said. In a conversation after the talk with reporters from the Daily and the Fletcher Forum of World Affairs, the Fletcher School’s student-run international relations journal, Castro explained that countries like China have attempted to leverage these foreign policy deficiencies to get closer with traditional U.S. allies like Mexico. “Like it or not, they’re starting to move around the United States and make new alliances,” he said. Castro also stressed that, for the time being, America’s pre-existing alliances remain strong — despite all of the uncertain rhetoric. “Many of our allies are still hoping for the best; they’re hoping that the President’s words are mostly words,” he said. Castro, who co-chairs the Congressional Association of Southeast Asian Nations Caucus, discussed geopolitical events in Southeast Asia, as well as Trump’s policies toward North Korea and China. While he praised the thaw in relations between the Koreas during Trump’s time in office, Castro criticized the president’s denuclearization policy. “If the goal was to make sure that North Korea did not further its nuclear power, on that score I think the president has failed,” he said. As for the escalating trade war with China, Castro was uncertain of the policy’s goal but clear on impact. The conversation then shifted to cybersecurity. Johnstone cited that Castro recently introduced the Secure America from Russian Interference Act. Castro explained that he sees protecting elections as one of the major challenges facing the United States today. Asked more about that point during the question-and-answer portion of the event, Castro advocated for large-scale international cybersecurity policy. “We have to move more quickly toward mutual cyber-defense treaties,” he explained. Castro elaborated on his vision for cybersecurity policy during the post-event discussion. “Until recently, we’d never dealt with challenges like this in cyberspace on such a large scale, where our democracy was challenged,” he said. In explaining the need for reform, he noted that NATO’s current cybersecurity policy gives limited options and does not sufficiently protect against election hacking. Johnstone’s final question, which concerned Texas’s growing Latino vote and how it may change the state’s political representation, allowed Castro to discuss domestic politics. Castro explained his belief that the Democrats need to engage nonvoters, rather than flip Republicans, to start winning races again in a state that used to be reliably blue. “Part of the challenge in Texas is historically, we’ve been one of the states that has one of the lowest rates of voter participation,” he said. Castro explained two causes for this lack of participation, the first being a lack of voter education. Sharing an anecdote about a time he did not vote for low-level races because he lacked information and worried about making a bad choice, Castro said that to non-voters, the same problem exists for all races. “When you’re somebody that hasn’t voted, I really believe there’s a paralysis that takes place because there’s a lack of information,” he said. Castro told the Daily that a lack of diversity in candidates for office has also limited voter participation among women and minorities. He expressed hope that this year, which has already seen high-profile primary victories by women of color including Ayanna Pressley, Congress will be more representative. During the Q&A session, Castro spoke about the emphasis he places on constituent correspondence and in response to the final question of the evening, explained the crux of his view of America’s role in the world. “The United States should remain a nation that tries to keep the world safe,” he said.